CHECK OUT THIS STUNNING CUSTOM-BUILT 5200 square foot walkout ranch with all the extras. 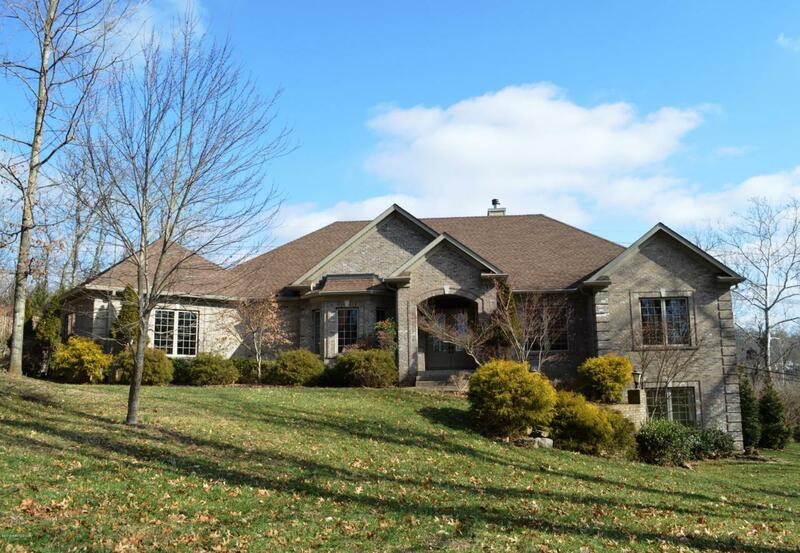 Over 3200 plus square foot on the first floor with an additional 2000 square feet finished in the walkout basement. Very open floor plan. 9ft + ceilings, 4 bedrooms, 3 1/2 baths. Open kitchen, separate dining room, foyer, Great room with trey ceiling and fireplace. Access to covered deck from Great room . Master has double trey ceiling with recessed lighting and master bath. Two additional bedrooms on the first floor share a Jack and Jill bathroom. All bedrooms have walk-in closets. Office! Walkout basement has family room,wet bar with granite countertop, game room with access to covered patio. Fourth bedroom, full bath and a extra storage room. 4 car attached garage.Amenities include: extensive crown and dentil moldings, top-of-line granite, trey ceilings, double-trey ceilings, beautiful Travertine flooring in kitchen and bathrooms, cherry cabinets throughout and hardwood flooring with inlay medallion and flourishes. Sauna stays.